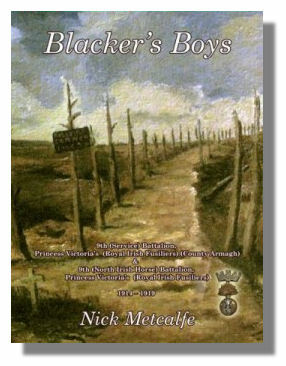 For the first 11 days of April Lieutenant Colonel Blacker was on leave at Carrick Blacker. 108th Brigade spent the period in reserve to 109th Brigade. Battalion Headquarters and ‘C’ and ‘D’ Companies were at Hedauville. ‘A’ and ‘B’ Companies were in Mesnil detached to 109th Brigade. 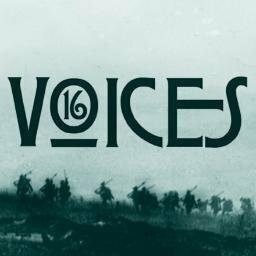 On the left of 36th (Ulster) Division (over the boundary between X Corps and VIII Corps) was 31st Division, soon to be replaced by 29th Division. On the right was another of the divisions of X Corps, 32nd Division. The 29th and 32nd Divisions would flank the Ulstermen through to and during the attack on 1 July. For the next three weeks the Battalion would be engaged in work parties of one kind or another digging trenches, and burying signal cable, initially in perfect spring weather that deteriorated as the month wore on. During the intermittent shellfire, a single shell hit Mesnil on 3 April and caused twelve casualties in ‘B’ Company, including Private James Hall, who was killed, and Privates Joseph Bulman, Thomas Houston and John Vennard, all of whom were badly wounded and later died of their wounds. Private Robert Sturgeon was wounded in the neck and arm. Four men from 11th Royal Inniskilling Fusiliers and the Royal Field Artillery were also wounded by this shell. The Battalion football team was victorious again in a match against 10th Royal Inniskilling Fusiliers (5-1) on Saturday 8 April, and that evening a Regimental concert was held. This period also saw the formation of the Brigade Trench Mortar Battery, equipped with the new 3-inch Stokes mortar. All of the battalions provided manpower and 9th Royal Irish Fusiliers lost Second Lieutenant Samuel O’Neill and some good men to the new unit. For the remainder of the war the Battery would see men from the 9th Royal Irish Fusiliers move in and out of its ranks. 20319 Joseph Bulman, died of wounds on 26 April 1916; Forceville Communal Cemetery and Extension. 14260 Private James Hall, killed in action on 3 April 1916; Mesnil Ridge Cemetery. 20305 Private Thomas Houston, died of wounds on 10 April 1916; Doullens Communal Cemetery Extension Number 1. 19750 Private John Vennard, died of wounds on 9 April 1916; Beauval Communal Cemetery. Nine others were wounded, including 16422 Private Robert Sturgeon.